A promise is a pledge to undertake something within a committed frame of time. It is the word of a Customer Service Professional that he must honour. Promises kept can build up a sales relationship beautifully. Broken promises, on the other hand, can break a heart, ruin a sale and chase away a customer faster than ever. They believe the hope on which everyone lives. The tale of the Indian tailor is the starting point of a Rs.5,000 crores readymade garment industry. To many the Indian tailor is a symbol of broken promises. Sure, there are many good, trustworthy tailors who keep their promises. A good example of the promise –breaking kind is the tailor who is entrusted with the job of stitching your wedding suit or even an ordinary shirt or a pair of trousers. Try as you might, it is not possible to get him to give your wedding suit to you on time. Uncaring of the big day in your life, when you are going to make a promise of a lifetime, he keeps calling you for trial after trial, keeping you on tenterhooks till the very last moment. He has a million excuses that he trots out at the drop of a hat. And just when you are beginning to think that your birthday suit is the only option to dress up in on this momentous occasion, the Indian tailor – that master of the photo finish – delivers your wedding suit. The outcome of this painful Brand Experience is that you vow never again to get a suit, a shirt or a pair of trousers custom–stitched. Not when you have the option of walking into a readymade garment store and picking up the best set of garments from the shelf. Today the Indian tailor is a vanishing species. His business is down while the readymade garment industry is growing because the tailor did’nt practise my Promising Customer Service Prescription. In a case in the IT industry, when the computer industry erupted in India, there was a rush to book orders and swell sales, often with little consideration to my Promising Customer Service Prescription. Collecting orders is all very well, but without a sure fire plan to ensure that the promises made are also kept, it can be a walk down the disaster street. Buying an IBM Aptiva was one such disastrous Brand Experience for a family that wanted to invest in their childrens’ education. Having decided that the young minds at home could do with a little help from the latest cyber age gizmo, the family trotted off with children in tow to Tangerine, a computer chain store, which also happened to be a dealer of IBM. Closing the sale was easy for the salesperson at Tangerine. She claimed that there was a shortage of stocks and that prices would go up any day. If the family booked immediately, they could get the low price advantage. The father, eager as ever to get the computer installed in his home, agreed; and it was decided that the cheque should be collected at a particular time, the same day. Prompt as ever, the sales girl from the store picked up the cheque on the scheduled hour on the same day. But delivery and installation, which was promised the following week, was another story altogether. There was excitement at home on the appointed day the following week. Dad made it a point to be home early despite a pressing business engagement. Mom and the kids waited patiently for the computer to arrive and get operational. But the hours passed without so much as a word from Tangerine. A few hours and a phone call later, the family was told that the delivery and installation could not take place on the promised day. The computer installation happened a few days later, by which time the excitement of the purchase had all but evaporated. Evidently, once the money was collected, the store could’nt have cared less if the promise made was kept or not. It is hardly surprising to learn that Tangerine, the computer chain store, subsequently folded up. Naturally, not all IBM dealers are the same kettle of fish. Some of them are excellent. It is just that Tangerine was one computer chain store that was unaware of my recommended Promising Customer Service Prescription. On the other hand, brands like Hewlett Packard, including Compaq, rule the roost because their dealers know the value of a promise. British Airways proved to be a case of contrasts. Flying from Orlando to Mumbai via London proved to be a mixed bag of sentiments for an Indian family. Careless promises in one country were set against the sensitive handling of a case of misplaced baggage. Returning with the kids from trip to Disneyland, the airline staff at Orlando seemed insensitive to the family, assuring them that the baggage had been tagged properly when in fact it had not. The bag in question belonged to a little girl who had stuffed it with all the precious Disney memetos she had bought. In transit from London’s Gatwick to Heathrow airports, the bag disappeared so that when the family tried to retrieve their baggage in Mumbai they were a bag short and had the little girl in tears. If British Airways goofed in Orlando, the Mumbai staff was all concerned and gratitude. They claimed a 99.9% recovery rate and were more than hopeful of retrieving the little girl’s favourite Disney stuff. They kept in touch with the family on a daily basis and never allowed them to lose hope. In the end the baggage was retrieved, the little girl relieved and the family’s faith in British Airways restored. They still fly by the same airline. Remember the Allianz Insurance ad in which the dad promises to call up his daughter while on a business trip? Flying across continents and keeping his hectic business schedule does not deter him from keeping his promise. The result, a smiling daughter. I recommend practicing the Promising Customer Service Prescription religiously and regularly. It is important to promise only if you can deliver. Never over promise. If a Customer Service Professional breaks a promise, you can be sure he will lose the customer and the sale. 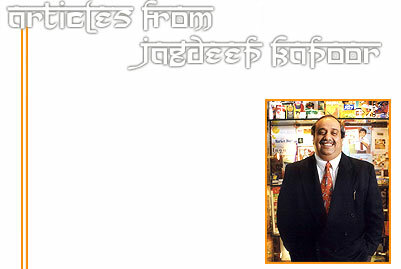 Copyright © 2008 All rights reserved with Jagdeep Kapoor, Managing Director, Samsika Marketing Consultants Pvt. Ltd. No Part of this document may be modified, reproduced, stored, deleted or introduced in any retrieval system or transmitted in any form or by any means (Electronic, Mechanical, Photocopying, Recording or Otherwise), without the prior written permission of the copyright owner of the document.